Business owners and managers have an obligation to keep the workplace safe for their workers. But on construction sites, in warehouses and even in retail stores, the chances of an unsecured object falling on top of you can be high – especially if the proper safety precautions were ignored by your employer or coworkers. Objects that fall from even a few feet above can cause serious injuries to workers, and you could face mounting medical bills and lost wages because of them. At the Rocky McElhaney Law Firm in Nashville, we’ve stood by workers injured on the job since our inception. Our founder, Rocky, experienced first-hand what it’s like when an injured worker is denied compensation, and what kind of stress that can cause the worker and his/her family. At our firm, we are relentless in our pursuit of justice and compensation for our clients. If you or your loved one was injured by a falling object, you can trust in us to protect your rights and your future. 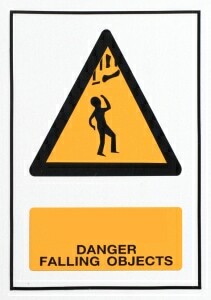 According to the Bureau of Labor and Statistics, hundreds of workers are killed each year because of falling objects. The construction industry sees the most amount of injuries and fatalities, but farmers, miners, foresters and warehouse workers are also at risk. One of the most important things to remember is that not all injuries are immediately evident. If you’re struck by a steel beam, you’ll likely see the effects straightaway – but if a drill falls on you, it might take a little while for the consequences of the injury to show. Workers injured by falling objects could develop blood clots, suffer nerve damage or endure fractured bones, and may develop problems with communication and motor skills if the object causes a traumatic brain injury. This is why it is crucial that you seek medical attention if you’ve been injured at work. But after you see a doctor, make the Rocky McElhaney Law Firm your next stop. Our workers’ compensation attorneys understand how serious being hit with a falling object can be, and we know what kind of consequences you may face if you don’t get the help you need. We walk you through the process of filing for workers’ compensation, and fight on your behalf if your employer fights your claim. We refuse to back down until you get the compensation you need to get started on the path to recovery. At the Rocky McElhaney Law Firm in Nashville, we focus on protecting the rights of the injured. Being struck by a falling object can cause irreparable consequences if you go without proper treatment. We fight aggressively to ensure that you get the treatments you need. Please call 888.619.4765 or fill out our contact form to schedule a free consultation with a member of our team. In addition to Nashville, we proudly serve clients in Murfreesboro, Memphis, Knoxville, Kingsport, Hendersonville, Columbia and Chattanooga.